Special glasses help Kathy Beitz, who has been legally blind since she was 11. Kathy Beitz has been legally blind since she was 11 years old, but she got to see her newborn on the day he was born by wearing special glasses. In a YouTube video that is quickly going viral, she gasps and says "Oh my god!" as she holds baby Aksel in her hospital bed for the first time. "Look at his long toes," she says. "I think he looks like us." (Yvonne Felix and Ty Tekateh) A blind woman sees her son for the first time with eSight glasses. Beitz, 29, who lives about two hours away from Toronto, told ABC News she suffers from a kind of macular degeneration called Stargardt. Though she is not completely blind, she has a blind spot in the center of her vision, she said. 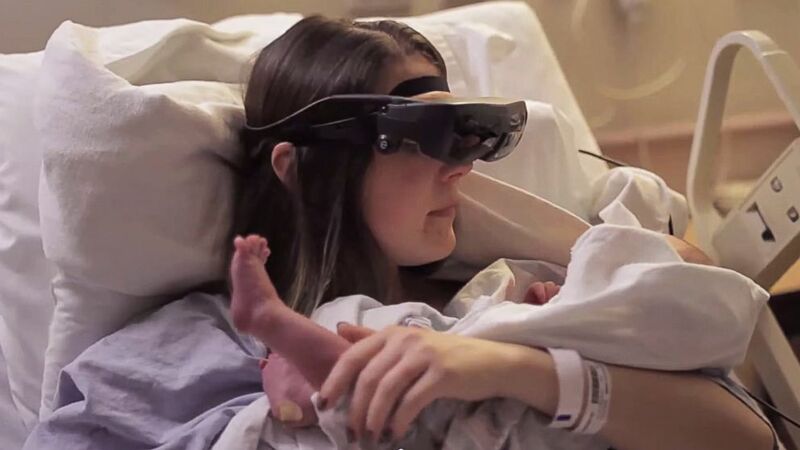 She looked at her baby through specialty glasses called eSight Eyewear. The glasses cost $15,000 and are not covered by insurance, but Beitz received them thanks to eSight's fundraising program, said Taylor West, eSight's outreach director. He said the glasses, which are registered with the U.S. Food and Drug Administration, work by capturing real-time video and enhancing it for the legally blind to see. About 140 people have eSight glasses in North America, West said. According to the YouTube video that Beitz's sister posted this week, it was the first time Beitz ever saw a baby. "For the first baby that I get to actually look at being my own is very overwhelming," she told the camera. Beitz told ABC News that baby Aksel is now 6 weeks old and doing great. She got the glasses on the day of her cesarean section. She said they make it much easier for her to care for the infant, go to the grocery store and complete other tasks that would otherwise be difficult.